Thomas Moran was born in 1837 in Bolton, England—the fifth of seven children. His father was a handloom weaver. The industrial revolution motivated the family to move to the United States to escape unemployment and poverty. The Moran family settled in Kensington, near Philadelphia. Thomas Moran’s older brother, Edward, was the first to pursue art and become a successful marine painter. Young Thomas never had any formal training but was influenced by his older brother and his brother’s studio mate, John Hamilton. Thomas began frequenting his brother’s studio by 1855 and accompanied him on sketching trips. In 1862, the brothers returned to England to study the works of J.W.M. Turner. Thomas made copies of the paintings he saw at the National Gallery, trying to replicate the color and luminosity of Turner. When Thomas returned to America, he found work as both a fine artist and a commercial illustrator. In 1871, at the request of Scribner’s Magazine, he was to redraw an amateur’s sketches of a trip to the Yellowstone region in Wyoming. Based on the unusual terrain in the sketches, Thomas decided to visit Yellowstone for himself. He borrowed money so he could accompany a survey party that was returning to the area later that year. The trip so inspired the young artist that he dedicated his life to the depiction of the American West. 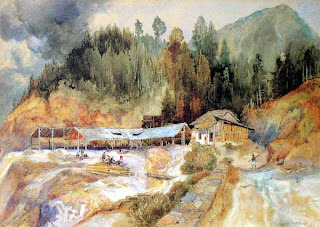 Thomas Moran never painted with oils while traveling; instead he preferred to make sketches in watercolor, gouache and pencil and later translate these into his great pictures. He was not interested in recording nature literally. For Thomas, the truth was in his impression of the place. He used all means at his disposal to heighten the effect he was after. 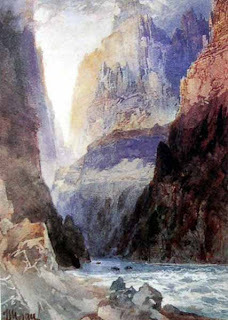 It is believed that Thomas Moran’s paintings helped to secure Yellowstone and the Grand Canyon as National Parks. His paintings, Grand Canyon of the Yellowstone, Chasm of the Colorado and Mountain of the Holy Cross became icons of the American Landscape. At the turn of the century, Thomas Moran was attacked for being outdated. However, Moran’s paintings never fell out of favor with the public. He enjoyed continued artistic success until his death at the age of ninety.